Kingdom Hearts 358/2 Days: The Novel Cover Art Revealed! More and more Kingdom Hearts products are making their way to shelves as the holidays and Kingdom Hearts 3's release loom closer. In November, Kingdom Hearts 358/2 Days: The Novel written by Tomoco Kanemaki and illustrated by manga artist Shiro Amano will release in English for the first time in the West. 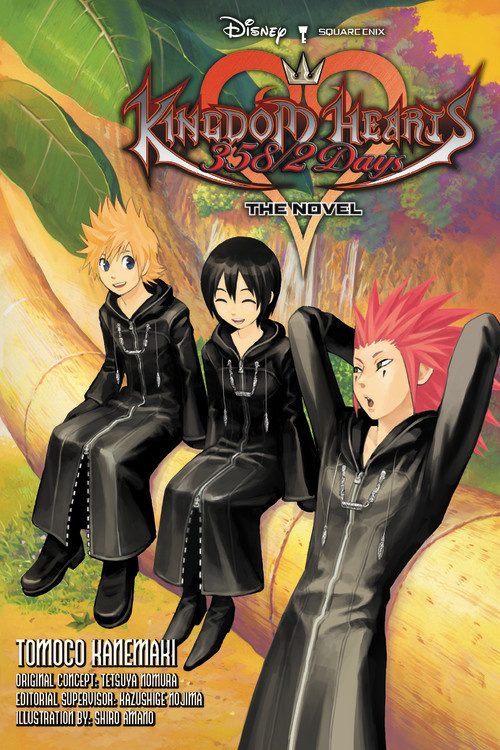 The Kingdom Hearts 358/2 Days novel initially released as a trilogy in Japan and provided more in-depth story and characterization to the overall story of the video game. Consider spending this holiday season reading the upcoming Kingdom Hearts 358/2 Days novel as a way to pass the time while waiting for Kingdom Hearts 3! Remember to pre-order the Kingdom Hearts Birth By Sleep novel set to release March 2019! Also, don't forget to pick up a copy of Kingdom Hearts: The Novel, Chain of Memories: The Novel, Kingdom Hearts II: The Novel Volume 1 & Volume 2, and the Kingdom Hearts manga series by Shiro Amano! Excellent. I'm really excited for this one. Does RAX meet Pluto and Xion squees all over him like in the manga? If the novel doesn't incorporate those scenes I'll be disappointed. IIRC no but we do get more Xion and Riku scenes and flesh out her time with him more, including where he took her to chill since he couldn't take her back to the mansion. Always excited to see Days get some more lovin'. I can't wait to read what new details Tomoco has for us. And it's nice we'll get it in omnibus form (it just made the year waiting after KHII harder). Though, BBS has a shorter release window, maybe they are working on them simultaneously. I remember being confused by the 2016 announcement. Apparently Days (like CoM) is bundled all into one, but only BBS's first two of three novels are going to be merged? Birth By Sleep will be one omnibus at around 416 pages, actually. After BBS we should be getting the short stories, and then hopefully they will announce coded, KH3D, and then UX. We are so lucky that KH3 will likely have rereleases and new content throughout 2019 so these novels will continue to be relevant. Yayyy, novels! I can't wait to read them~ Thanks for providing links for the rest of the novels too! So excite to dive into all the introspection that the game can't cover. Oh, that's great then. Wow, Days is actually longer! It always makes me laugh when people get confused why we even touched on Days in manga or novel form. There's a lot of exposition and character dynamics that really help cement some otherwise 2D cast members. Neat I guess... not really much into reading honestly. That was one worry I had myself, but you're totally right. There's almost certainly going to be some additional content throughout next year, whether it be DLC, Nintendo Switch ports, or maybe even an eventual KH3 Final Mix once any DLC is finished. So any merchandise will continue to hit shelves. I swear to god last night you had this chipper post about being excited about the novel and said thanks for sharing the links to the other novels. How did it go from that to this? More Days content? Sign me up!! !